THE SUN IS OUT, TIME TO RAISE THOSE HEMS! It's official, the sun is finally here! So in honour of the lovely weather, we have chosen Blossom for our April 'look of the month'! Blossom is part of our Jane&Edward collection. It is a take on the classic 1950's tea length style, made with blush silk dupion, which holds the beautiful shape created by the box pleated skirt. We've used a very lightweight, Chantilly lace to cross over the sweetheart neckline and the waistband. We've created a lace drape over one shoulder which provides a little cover for the bride during the day as well as making a bit of a statement! The lace drape, which is also detachable, is embellished with a matching blush silk flower created by the wonderful Sugar Butterfly. A raised hemline means you can definitely show off these beautiful Harriet Wilde shoes. 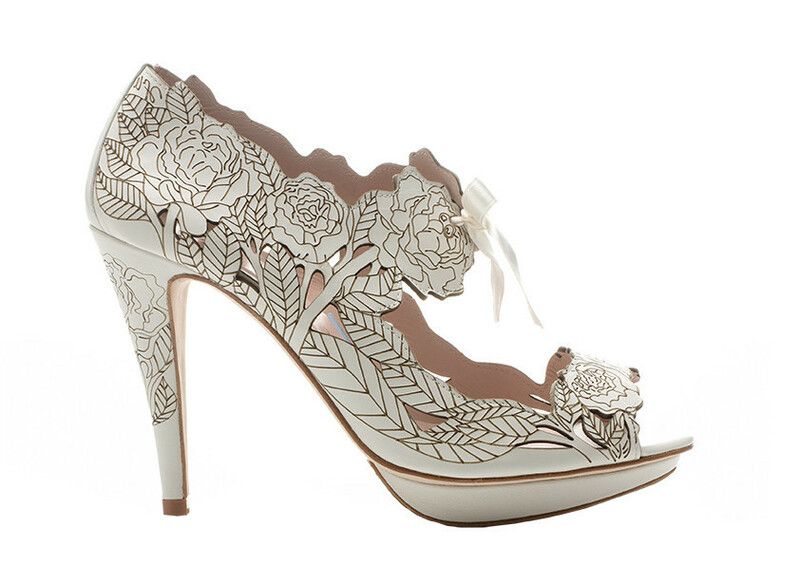 Crafted with an intricate floral laser cut design, Peony is a dainty sandal style tied neatly onto the foot with a pretty ribbon tie. Making them the perfect accompaniment to any dress! Don't forget, as we mentioned in our previous blog, Ruth from Harriet Wilde will be in our shop for our designer event on Thursday 30th April! From 4-8pm you will have the chance to meet Ruth and make the most of our special offers we have on Harriet Wilde shoes for one night only! If you have any questions or want to RSVP then just call us on 01746 768968. Last but not least, to accessorise this look we have chosen a one-off pearl necklace and this beaded rose tiara by Rachel Hyde. Sticking to our floral theme, the pink roses in the tiara go perfectly with the Sugar Butterfly flower on the dress and the warm shade of pearl in both of the accessories really compliment the whole look. If you want to try this look or any of our other inspirational ideas for yourself then don't hesitate to get in touch on 01746 768968 to book your appointment.